heads, but you might also find a dead chick abandoned on the coop floor. at bay, but our last batch had to be motherless — how to protect them? killing our chickens, cats, or dog. leaving food out in the coop. I remember a somewhat squicksome News Of The Weird story about some village somewhere (Africa?) who dealt with their rat problem by catching rats and sewing their anuses shut with a stitch or two of thread. Unable to defecate, the rats would go insane, and attack and kill many other rats before dying themselves. Wow, that’s…gruesome. I think we non-farmers tend to underestimate the devastating effects of rats if people have been driven that far to control them! That’s a pretty cruel control measure. While I’d have no problem taking out the rats, I wouldn’t be able to do it so cruelly. But anyway, thanks for this info. I always thought that chicks would need to NOT be outside for the first 6 months or so. That they can go out at 3 weeks would really make keeping them inside go over better with the wife. You might be a good candidate for an outside brooder. I was thinking of making one this year after raising so *many* batches — we basically had chicks in the house for four months this year. Something right outside your front door that is predator-proof, warm, and dry would be great, especially if you planned it so that you could add a run to let the chicks start exploring the outdoors early. A mother hen will actually take her chickens out to forage on day 2 or 3, and the earlier you get them out there, the healthier they are! You are correct about leaving food out. The rats are looking for food and are good at doing that. You have to keep the food away from their reach. 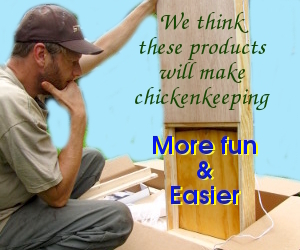 I did that by getting a “rat-free chicken feeder”. I got mine out of Oklahoma City thru the internet at “thecarpentershop.net”. One of the best decisions I ever made. My chickens took only a day or two to become masters at stepping on the treadle bar and then the door just swings open and when they finish feeding they just leave and the door swings shut sealing off the food access.I was amazed how well it worked.